Did Snoke have any other apprentices before Kylo Ren? We know that Kylo Ren is Supreme Leader Snoke's apprentice, but recently I was wondering: Did Snoke have any other apprentices before Kylo Ren? 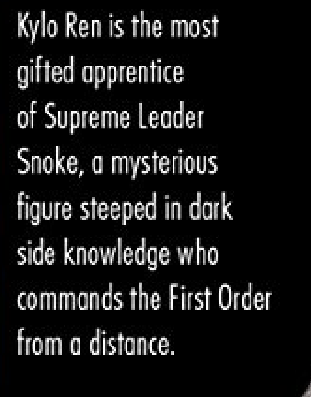 Snoke has had at least one other, and potentially several other apprentices over the years. "Force sensitive, and highly attuned to the dark tide but not a Sith, Snoke has trained Kylo Ren and least one other apprentice." And the Visual Dictionary for The Force Awakens states that Kylo Ren is the most gifted of (presumably) several apprentices. "Kylo Ren is the most gifted apprentice of Supreme Leader Snoke, a mysterious figure steeped in dark side knowledge who commands the First Order from a distance." Why didn't Kylo Ren use the Force to extract information from Lor San Tekka? Do the Knights of Ren follow the Rule of Two? Why would Kylo Ren answer to Snoke? How does General Hux find Kylo Ren in time? Did Kylo Ren ever actually start training with Snoke? Is there any knowledge on who the six other members of the “Knights of Ren” are? Has Kylo Ren actually met Supreme Leader Snoke? Did Kylo Ren's plan work too well?